Still, no matter how we feel about this holiday as parents, no matter what “they say” about it, kids seem to love it. No matter the purpose behind the day, I love it, because it gives us an extra reason to focus on showing our children how much we love them. I don’t think that could ever be a bad thing. We can show our kids love by hugs, kisses, and by just being in the moment with them. Honestly, these three things alone would make for a fantastic day! 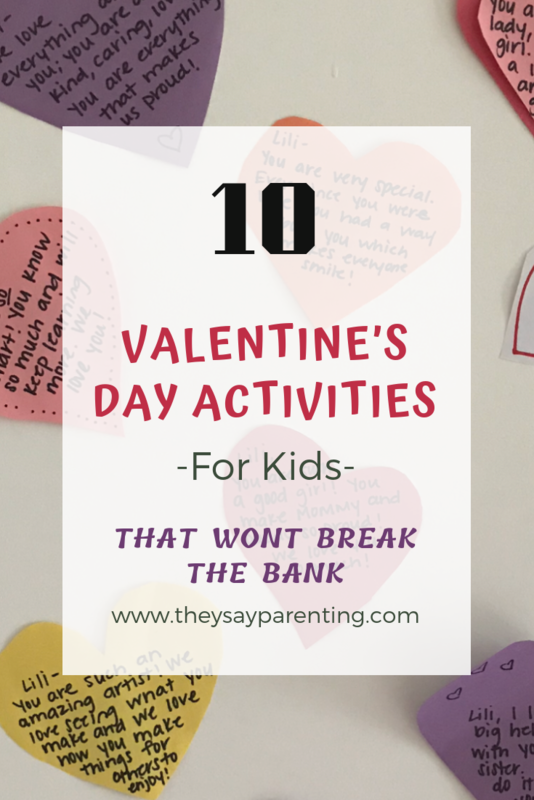 For those of you looking for a new activity or for a little something extra this year, here is a list of 10 Valentine’s Day activities that won’t break the bank. 1. Cover your kids’ doors with the things you love about them. The idea: Starting the morning of February 1st and ending on Valentine’s day, cut out a heart and write down one thing you love about your child. You can write about something they do well. You can write about a quality they possess. You can write about something they did which made you proud that day… anything! You are such a great big brother (or sister). You are such a big helper. I loved how you helped clean up the table last night. Each night, we taped the heart on the outside of the kids’ doors. Every morning, my kids were so excited to look at their door and see what we wrote about them. By the time Valentine’s Day comes around, they will have 14 hearts on their door. They didn’t want to take them down. 2. Make a mess with bath paints. Pull out some Valentine’s Day inspired bath paint colors and let the kids go crazy. They can paint hearts all over the tub and make the bathtub a fun color. 3. Have an extra special breakfast or lunch. For breakfast, try to make pancakes in the shape of a heart. I don’t know about you, but the keyword for me here is try. The kids love it no matter what, especially if the pancake is covered in strawberries, whipped cream, and maybe even a hint of chocolate syrup! For lunch, cut their sandwich into a heart with a heart cookie cutter. 4. Have some fun with pink slime. Elmer’s has a great recipe for making slime. Click here to see the full instructions. 5. Help the kids decorate their room or the house. Cut out some hearts or use heart doilies. Add stamps, stickers, or color. The kids can tape them up or hang them from a banner to display. Here is a fun craft gift set full of stickers and doilies, or simply use construction paper and any Valentine’s inspired stickers you can find. 6. Use a heart-themed craft kit. Decorate your own wooden heart or make wooden heart necklaces with these fun kits. 7. Make heart jewelry with Shrinky Dinks. My kids love Shrinky Dinks. They can color the designs on the special paper. Then, we bake them in the oven. The drawings shrink up and become hard, like plastic. It is pretty cool to watch. This particular kit makes heart jewelry. 8. Make a heart bird feeder. Don’t the animals deserve a little kindness too on Valentine’s Day? Have the kids string Cheerios onto a pipe cleaner and shape it like a heart. They can choose a place to hang it outside for the birds to enjoy. My children made these in MOPS kids as well. They were so excited to hang them up when they returned home. 9. Create heartfelt valentines for each family member. Valentine’s Day wouldn’t be the same without Valentines, so make cards for each other and exchange them. Everyone can write or draw something they love about each family member. You can even throw in a nice conversation starter while you work: Talk about how important it is to show each other love and kindness—not just on Valentine’s Day—but every day. 10. If Valentine’s day is about showing each other how much we love and care, then what a great time to talk about being kind to others! Valentine’s Day is a great day to talk about kindness. Words and Your Heart, by Kate Jane Neal, is a great book about how powerful our words can be. Words can make people feel better or they can make people hurt. My five-year-old was able to grasp this book, and it can be used for older children as well. How we can show each other we care, not just on Valentine’s Day, but anytime? How can our words make others feel good? How can our words make others feel bad? Brainstorm examples. This particular book does a nice job of talking about how our words can make each other happy or sad, and how our words can either encourage and build each other up, or just the opposite. Another fun book which has underlying concepts of kindness, sharing, and giving is The Rainbow Fish, by Marcus Pfister. I hope this list will make your Valentine’s Day extra special this year! But remember, it is not about the number of activities you provide, how much money you spend, or the gifts that you give. It’s about love. If our kiddos know they are loved, then I’d say we are winning! My favorite is a heartfelt cards for each family members. Love all the ideas! Hi Anh! You are so welcome! My kids are loving this one again this year. Every morning I hear them, “What do our doors say today?” I was surprised that my daughter remembered from last year and requested it again. What a great post! I love the idea about writing something special on a paper heart and taping it to their door leading up to Valentines Day! I’m definitely going to check out those books as well. Thanks for the great ideas! Hi Kristal! Thank you so much! That is one of our favorites too. I think it means a lot to the kids. I love watching the smile on their face when they hear something great about themselves. It’s the sweetest. I love these ideas! My kids love Valentine’s Day, and these would totally make their day. Hi Tiffany! Thank you so much and I am so happy that you enjoyed the tips!